PORTLAND, MAINE — MARCH 1, 2017 — The Wild Blueberry School Foodservice Program, newly launched by the Wild Blueberry Commission of Maine, and boosted recently by a $50,000 state marketing grant, is already bearing fruit. Last month, for the very first time, Minnesota public schools joined Vermont, Maine, and 14 other states in offering Wild Blueberries through the USDA Commodity Food Program. In so doing, Minnesota became the nation’s first public school system to offer frozen Wild Blueberries to its 553 school districts in a new convenient 24-pound case, which includes eight (8) 3-pound bags. 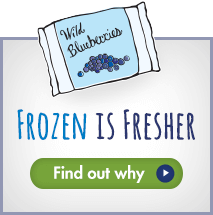 Previously, frozen Wild Blueberries were offered only in 30-pound bulk cases. The packaging upgrade is designed to accommodate school kitchens by enabling small batch cooking and smoothie making, reducing the need for re-packing, and alleviating pressure on kitchens with limited freezer capacity. Armed with convenient packaging, The Wild Blueberry Commission of Maine is actively targeting 36 U.S. states that have not added Wild Blueberries to their USDA Commodity Food lists. The effort is rolling out in conjunction with National School Breakfast Week, a weeklong celebration, from March 6-10, 2017, designed to raise awareness of School Breakfast Programs and to promote the connection between eating a good breakfast, academic achievement, and healthy lifestyles. The campaign also coincides with favorable new USDA yield data establishing that one pound of frozen Wild Maine Blueberries provides 25% more servings than the same weight of frozen cultivated blueberries. McBrady continued: “The new yield data lowers the cost per serving for schools, and the new packaging offers a convenient new option that should be highly attractive to schools in the commodity food program.” A robust school food service program will strengthen Maine’s Wild Blueberry industry, which has recently experienced larger-than-expected crops and fierce competition from the cultivated blueberry industry, she added.